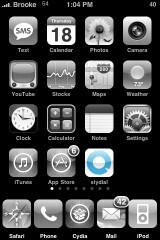 The thing I like about the iPhone application is that you do everything on your iPhone. If you call into the syldial phone number, you have to know the person’s number that you would like to call because you have to enter it in. On your iPhone, you can choose a number from your contacts and then not worry about a thing and just let the app do all the work. I have found that if you use the service frequently, you have to listen to a short advertisement before it connects to the person’s voicemail that you are calling (but, that is what you get with a free service!). I tested this application on people with three different carriers (Sprint, AT&T and T-Mobile)…it worked on all three carriers. 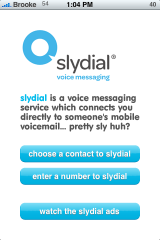 However, I had one person say that when I called them using syldial, their phone rang once and then acted as if I had hung up and then they received a voicemail from me…even after multiple tests (they use T-Mobile). But, I had another person say that their phone did not ring but just showed they had a voicemail from me (this was an AT&T customer). I personally would prefer that it did not ring once before going to voicemail. 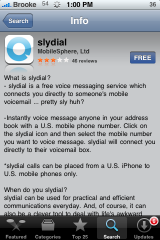 For more info check out slydial’s website. – When you are short on time. – When you don’t want bother someone. – When a text message just won’t cut it. this is a great app but for some reason when I dial my gf number it keeps telling me that I need to dial a US or Canadian phone number and my girlfriend and I are on the same AT&T plan. So I dont know whats wrong with that. Please we need a uk version please. i called the number but it sounds like its busy! i went to the website n said u really dont need to join there site! !